Lou Holtz is a name that can be recognized for multiple reasons. 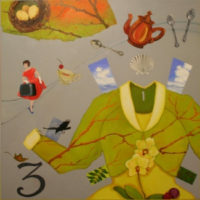 Many of those reasons are likely sports related. 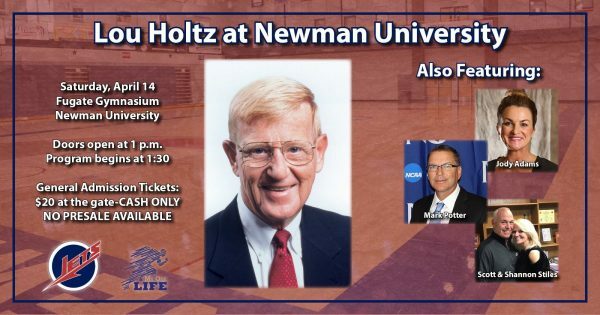 Now retired from a long career as a head football coach, Holtz has taken to motivational speaking, and Newman University got a taste of his motivational speaking April 14. Holtz, along with Wichita State’s former head women’s basketball coach Jody Adams, active sports community members Scott and Shannon Stiles and former Newman men’s basketball coach Mark Potter, spoke at the event directed at youth to help prepare them for challenges in their future. Holtz was the head football coach at the College of William and Mary, North Carolina State, the New York Jets, University of Arkansas, University of Minnesota, University of Notre Dame and the University of South Carolina. As well as coaching, he played football at Kent State from 1956-1957. One of his more recent jobs was being a college football analyst for ESPN. This event was put in motion because of the connections Newman has with both the Catholic community and the Notre Dame community. In Wichita, there are alumni groups from Notre Dame that have shown interest and excitement about one of their own coming to speak, as well. The event was made possible and sponsored by Newman University Athletics and My One Life LLC.